Proper ceiling fan care ensures that your cooling appliance continues to whir happily through the remainder of summer. The soothing whir of a ceiling fan is one of the sweet sounds of summer. But summer’s not over yet. To keep your fan whirring happily during the last of the hot months, take some time to treat it right. A good ceiling fan is relatively maintenance free. But it’s important to keep it clean, because dust can clog up the mechanism and build up over time on the blades, affecting their operation. This is especially true of fans in grimy or greasy locations like kitchens. 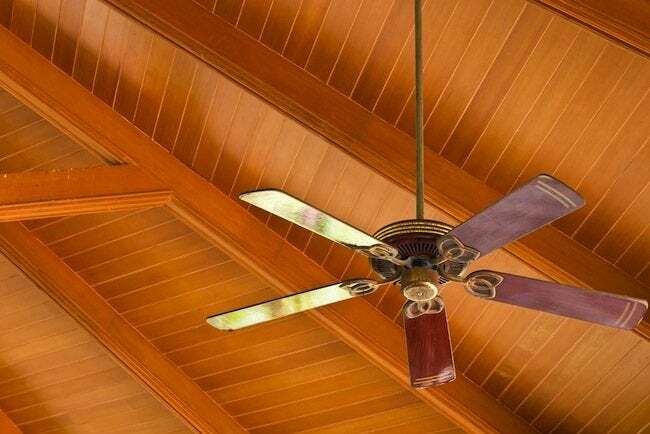 Dust the blades with a rag, dusting brush, or specialized ceiling fan brush. While you’re up there, tighten screws and other fasteners. Be gentle; if you bend the blades, your fan may start to wobble. Most fans today don’t require oil, although many older models do. If yours does need oil, there is probably a port above the motor housing. Always check your owner’s manual first. If your fan wobbles, it may be out of balance. Examine the blades to make sure they’re not warped or cracked; if they are, buy new ones. If the blades are OK, use a ruler to measure the distance from the ceiling to each blade tip to determine whether the blades are misaligned. If they are in fact misaligned, check the blade arms—the metal pieces that hold the blades—to make sure screws are tight and the arms aren’t broken or bent. If the blades are slightly bent, you may be able to bend them—carefully—back into position. Turn the fan on, check for wobble or noise, and repeat adjustments as necessary.